Flip Out Mama: Fisher Price Smart Tablet Review! I am so excited to bring you guys a review from Fisher Price today! You guys know they are one of our favorite brands! Well, the product we got to review was absolutely perfect for my Bean! He has been feeling a little left out of the technology loop lately, and I felt really bad for him. Mommy has her laptop that I am always on, Tater has his iPod and his 3DS and daddy has his iPad. Poor little Beanie has nothing at all, and he has been really jealous! We got the chance to review the Fisher Price Smart Tablet, and I can't even tell you guys how excited he was to unwrap that box! "Masey has an iPad! Masey has an iPad!" he just kept screaming! It was so cute! 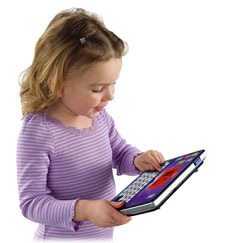 The Smart Tablet is adorable, and it is perfect for little ones! The screen lights up and changes colors, and there are tons of educational games and activities on it. 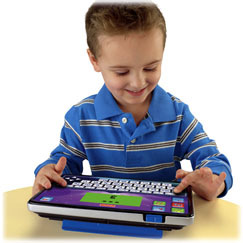 There are numbers, letters, music, typing, games, and more! It only takes three AA batteries, which we always have on hand, and it isn't too heavy for little hands. It even comes with a little pull out stand thingy for him to set it up on the table. One of Bean's favorite parts is that he can learn to count in Spanish too. This is a pretty cool toy, and for around $25.00, it's a good deal. I wish that it had a few more features, though, and the graphics are a little "old-schooly", but it is a $25 kids toy, not a $500 tablet computer, so what do you expect, really? It's perfect for my Beanie, I don't have to worry about him breaking it, and that is a very nice thing! All in all, my baby boy is really happy with his tablet, and I am happy that he is happy! 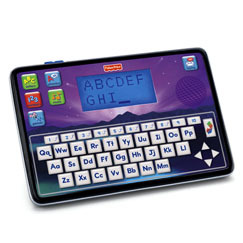 This is a great toy if your little one is into technology like mine is! If you wanna check it out, click here! I received this product free of charge in order to conduct a review. All opinions are 100% my own.